Quick search helps you quickly navigate to a particular category. It searches only titles, inclusions and the index and it works by starting to search as you type and provide you options in a dynamic dropdown list. You may use this feature by simply typing the keywords that you're looking for and clicking on one of the items that appear in the dropdown list. The system will automatically load the item that you've picked. You may use wildcards '*' as well to find similar words or to simply save some typing. 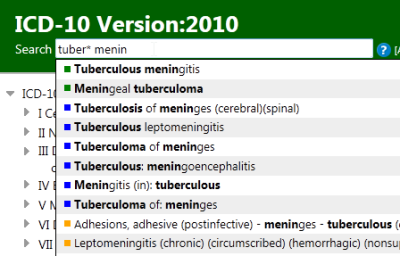 You may also use ICD codes here in order to navigate to a known ICD category. The colored squares show from where the results are found. You don't need to remeber the colors as you may hover your mouse on these squares to read the source.